For high-quality service as well as new vehicles that offer safety, reliability, fuel-efficiency and performance, you can trust Bathurst Honda. Since we opened our doors, Bathurst Honda treats every customer with respect and courtesy, allowing you to purchase or maintain your Honda in a pleasant environment where there is never any pressure. For a new Honda vehicle, you can rely on our team of experienced and courteous sales representatives. You will also find a complete collection of quality pre-owned models at Bathurst Honda and several advantageous financing solutions that are sure to meet your budget. 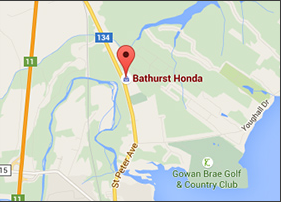 At Bathurst Honda we are always at your disposal to answer all your questions. We also offer a full range of after-sales services such as maintenance and repairs, a complete tire center, and a genuine Honda parts and accessories department. At Bathurst Honda it is you, the customer that always comes first. To learn more about Bathurst Honda and our services and products, contact us today at 1 855 764-7347, or online using our chat service or our contact form. Welcome to our dealership virtual tour. At Bathurst Honda, we pay attention to every little detail and we are proud to share with you every corner of our dealership facility. We hope you will enjoy exploring and feel like home! Do not hesitate to click anywhere you see a symbol, surprises are waiting for you. We never know, you may end up finding your next new or used Honda vehicle, your Motorcycle, VTT and even the power equipment of your dream. Meet your new home!